HP has launched its new premium portfolio of Spectre x2 and Envy laptops at the Cannes Film Festival. 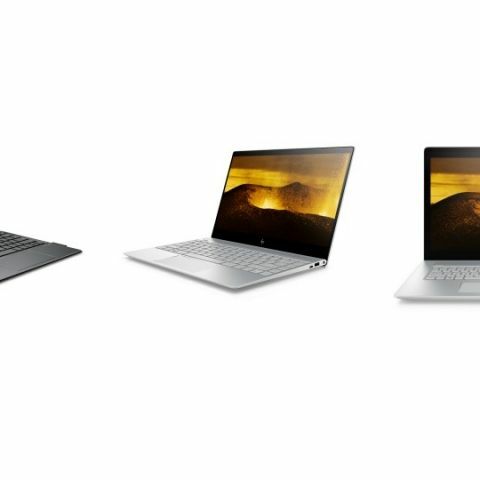 These include the HP Spectre x2, Envy 13 and Envy 17 laptops The three device are priced at $999,99, $1,029.99 and $999,99 respectively. In HP Inc.’s 14th year at the Cannes Film Festival, the company is not resting on its 75-year legacy of filmmaking innovation, debuting devices that reinvent the way people design, collaborate and create. From the company creating award-winning workstations and displays powering the film industry, HP’s new premium portfolio of Spectre x2 and ENVY laptops deliver the performance, design and innovation that empower today’s generation of digital creators to inspire the world like never before. HP Envy 17 3D - Owner's envy, or owner's pride? Every aspect of the company’s Spectre and ENVY PCs were designed to push creative boundaries and unlock new opportunities, reinforcing HP’s place at the forefront of reinvention. Bold engineering and cutting-edge design decisions will delight a generation eager to use technology as a canvas for self-expression. The Spectre x2, HP’s first luxury detachable designed for Windows Ink1, delivers it all, including a precise pen experience that was curated by the artist community and is sure to stun digital creators. The new ENVY laptops bring extraordinary performance in every millimeter, empowering users to change how they work, create and play without compromising style or function. The HP Spectre x2 brings the performance of 7th Intel® Core™ processors, durability of a stainless steel hinge and ability to create with Windows Ink to a premium detachable PC. Ink with precision in any mode: The Windows Ink Certified pen is pressure sensitive so emerging artists and creators can produce a wide range of artistic effects, from varying line weights to creating subtle shading and coloring. Additionally, the U-shaped stainless steel kickstand with the ability to function flat and up to 165° degrees is optimized for inking in any angle, and for any lifestyle, while providing exceptional durability to stand up to everyday use. Reinforced design with premium materials: A CNC-machined aluminum chassis and dark ash silver coloring with a copper kickstand provides more durability in each curve and contour for a refined design. Bright, strong display: A brilliant 12.3” diagonal 3K2K (3000x2000) display2 with 6 million pixels, bringing HD entertainment to the next level and providing a wider range of ambient light options, giving photographers or graphic artists better screen readability and visibility. Durable detachable keyboard: Providing a strong magnetic force to stay attached in any mode, along with a full-sized keyboard and responsive glass trackpad. High resolution cameras: Bringing a 13MP rear camera, 5MP WDR wide-view front camera and an IR camera3 for Windows Hello biometric authentication. Long battery life with HP Fast Charge: Stay entertained and productive with up to 8-hours of battery life4 and HP Fast Charge5 technology moving from 0% battery life to 50% on a 30 minute charge. The HP ENVY 13 Laptop reinvents performance and productivity on-the-go while the ENVY 17 Laptop brings desktop performance anywhere and transforms a creative canvas for wherever inspiration hits. Red-carpet ready design: A durable metal chassis offered in natural silver and silk gold alongside a sleek angular lift hinge allows for the fan to easily circulate air while offering a more comfortable typing experience. Boundless creativity: Offered with a UHD display6 providing more than 8 million pixels, quad speakers with discrete amplifiers and an HD WDR camera3 with wide viewing angels, creating and entertaining is a seamless transition. Secure content: The optional HP Secure Pad with embedded fingerprint reader and Windows Hello brings security features with convenience and the assurance your latest inspiration is better protected. Performance to do more: Bringing the ability to multitask with ease via the latest Intel® Core™-i3, Intel® Core™-i5 and Intel® Core™-i7 processors7, while optional dedicated graphics from NVIDIA® means better resolution, response rates and colors in the display for those editing photos or video.